Hundreds of thousands of Greeks rallied outside parliament in Athens on Sunday (4 February) to protest against the use of the term Macedonia in any settlement the government pursues with the ex-Yugoslav Republic to end a decades-old name row. The two countries have agreed to step up negotiations, mediated by the United Nations, this year to settle the dispute, which has frustrated the aspirations of Greece’s small northern neighbour to join NATO and the European Union. Thoroughfares in central Athens turned into a sea of people waving blue and white Greek flags in what locals said was the largest gathering in decades, easily outdoing rallies against austerity foisted by lenders on the crisis-hit country. Greece objects to Macedonia’s name because it has its own region called Macedonia, and argues that its neighbour’s use of the name, along with contentious articles in its constitution, imply territorial claims over Greek land. Protesters hoisted a giant Greek flag over the demonstration with a crane on Sunday. They held banners reading “Hands off Macedonia!” and chanted the national anthem. “I‘m here for Macedonia. Macedonia is ours, it’s part of Greece. 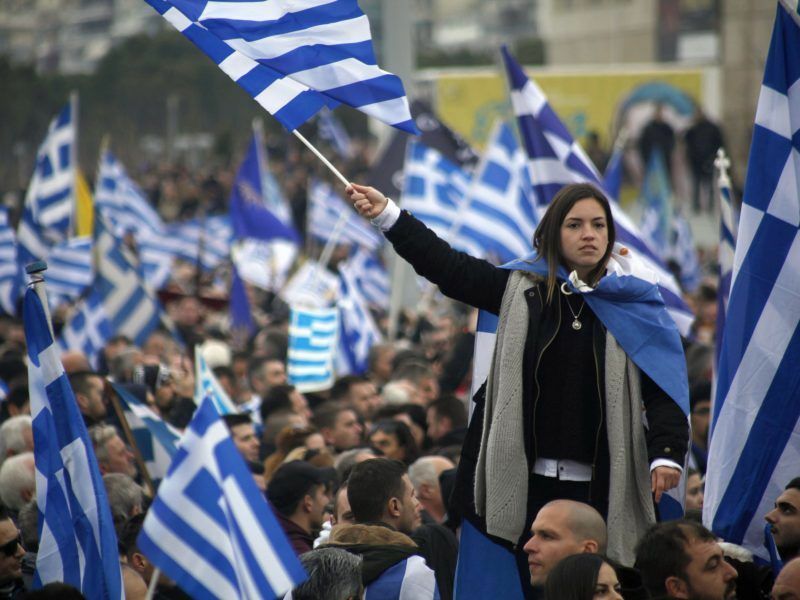 We won’t let them take it from us,” said 72-year old Persefoni Platsouri clutching a Greek flag. The case evokes strong emotions among Greeks who consider Macedonia, the ancient kingdom ruled by Alexander the Great, to be an integral part of their homeland and heritage. Talks also reopened at a sensitive time for a country which is struggling to emerge from its worst debt crisis in decades and to regain sovereignty over economic policy-making after years of austerity mandated by international lenders. Among Sunday’s speakers was world-renowned Greek composer Mikis Theodorakis, who said the eight-year economic crisis had not wiped Greece’s history from people’s memories. “If we give in, we are leaving the doors wide open for a tragic historical lie to come through and stay forever,” the 93-year old leftist, a symbol of resistance against the 1967-1974 military junta, told a cheering crowd. Talks between the two countries have been inconclusive since the Balkan state broke away from Yugoslavia in 1991. Due to Greece’s objections, Macedonia was admitted to the United Nations with the provisional name “The Former Yugoslav Republic of Macedonia” in 1993, which remains its official title in international organizations. A majority of countries in the world refer to it simply as Macedonia. Greece’s leftist-led government has proposed a compound name, with a geographical qualifier, which would be the only name that could be used for the country. 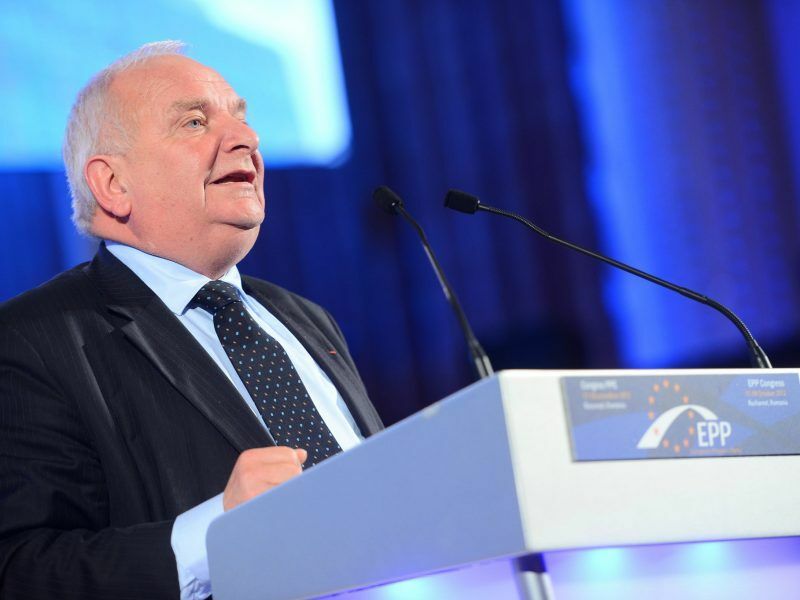 The leader of the centre-right European People’s Party (EPP) Joseph Daul hailed the “window of opportunity” to resolve a long-standing name dispute between Greece and the Former Yugoslav Republic of Macedonia (FYROM), saying he hopes for “concrete” results. But opinion polls in recent weeks have shown a majority of Greeks oppose the use of “Macedonia” in any solution. About 300,000 people turned out at a demonstration on 21 January in Thessaloniki, capital of Greece’s Macedonia region. 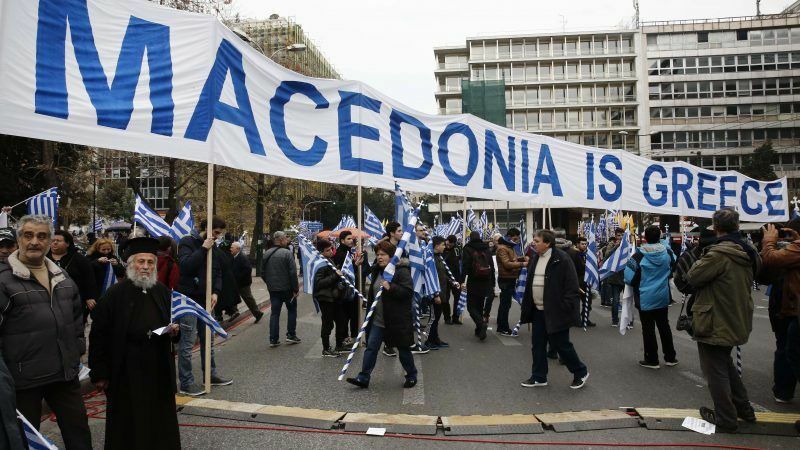 Tens of thousands of people took to the streets of northern Greece’s biggest city Thessaloniki on Sunday (21 January), police said, in a long-running row between Athens and Skopje over the use of the name Macedonia. The issue has also strained relations between Prime Minister Alexis Tsipras’ Syriza party and his small coalition ally, the right-wing Independent Greeks. The coalition government controls 154 seats in the 300-seat parliament. The Macedonia issue helped bring down Greece’s conservative government in 1993; the same party, now in opposition, has criticized Tsipras’ administration for its negotiating tactics. Foreign Minister Nikos Kotzias said last week that Greece is preparing proposals which would be the basis of negotiations for a settlement with its neighboring country. “Here are the borders. This is Macedonia … Macedonia is Greek, no one can take this name, no one can use it,” said protester Rania Mainou, pointing on a map. There will be zero tolerance with FYROM. If Zaev wanted to mend relations with Greece he would have announced the demolition of the grotesque Italian made Hellenic reproduction statues that litter the FYROM landscape, the renaming of the airport in Skopje, the renaming of the highway, the renaming of the football stadium, the removal of the repulsive Baroque Hellenic style facades, the correcting of school carriculum, the removal of the Hellenic symbol on the national flag, the removal of all greater Macedonia maps from government institutions and a heartfelt apolgy to the nation of Greece for his nation being vile for the last two and a half decades. Cultural theft cannot be forgiven easily. Actions speak louder than words. Greeks do not want to hear politicians trying new age diplomacy that they learnt in their political science classes. Dimitrov, Šekerinska, Zaevand all the Slavic Fyromians currently running FYROM are just as dogmatic about an exclusivity of the name as the Gruevski ultra nationalists. There is no scope for negotiation with these antiques. Greece is the victim here. Our history has been hijacked by Fyromian Slavs. Leave our history alone. It’s not a good fit for you. You cannot pronounce nor read the Ancient inscriptions for they are in Greek. If FYROM wants exclusivity to the name Macedonia they will have to change their official language to Greek for this corresponds with the Ancient Macedonian language. We Greeks embrace everyone as a Hellene as long as they speak Greek. You cannot have Bulgarian speaking Slavs of FYROM claiming they are Antiques. It’s ridiculous. Sekerinska can sit around bagging the VMRO for their crimes but she is just as bad. She claims she is a Slav and a non Antique and in the same breath attacks Greece for not recognizing FYROM. I thought that her hair incident would have knocked some sense into her. Dimitrov has also had a go at it. The fool was part of the negotiation team under Gruevski. He failed miserably because he too will never give up the name. These Slavs are like a dog with a bone but in their case the bone is plastic and has zero marrow. They know what they have to do and it will never happen. The constitutional name will not change because the antiquated population of FYROM will never vote for it. They have had way too many history lessons from Milenko Nedelkovski. The vile sneaky tactics of attempting to be admitted to NATO and the EU under their provisional FYROM name won’t work either. They are fruitless attempts at diplomacy that not only waste time but also soak up tax payers efforts. Think twice FYROM before attempting negotiations with the Greeks on their history. The Albanian, Roma and Turkish birth rate is twice that of the Slavs. While you lot are busy fixating about exclusivity of your name and your antique culture the non Slavic population of FYROM will become a majority group within their ancient wonderland. The last census was in 2001, these so called minority groups were are 35% collectively. I would hate to think what they are at now. 16 years of fertile breeding has to be worrying for the new government. Back off our history you deluded farm animals. Maybe you didn’t give a hoot yesterday and the sun lulled you into a false sense of security but seiing the Greeks react and knowing the historical fact that Macedonia has always been Hellenic me thinks you might need to rethink. Is it worth stealing a name? Particularly if you want to continue to benefit from the financial support Greeks have been giving Skopje and also formally becoming a NATO and EU member? Greeks have preserved their identity and history for thousands of years you think they’ll give it up now??? This issue of Macedonia is another example of how a historical past which produce what it is today. However, people hang on to the past and motivated by nationalism insist the past for the present. The past explains the presence but for the future resolutions or solutions should not be based on the past but on the present and look forward. We see this problem the world over. Disputes and such disputes causes conflicts we do not know. This includes territorial disputes often originated in colonial times or conquests and lost of territory in the past? Have we as advance in our civilising? We cannot allow our emotional attachments to rule the world. We should stop warring. We are all human beings and as long as we have enough space, let it go. It must be able to find a solution to a name. The people in FYROM and in Greece have a right to exist, to live in the international community.